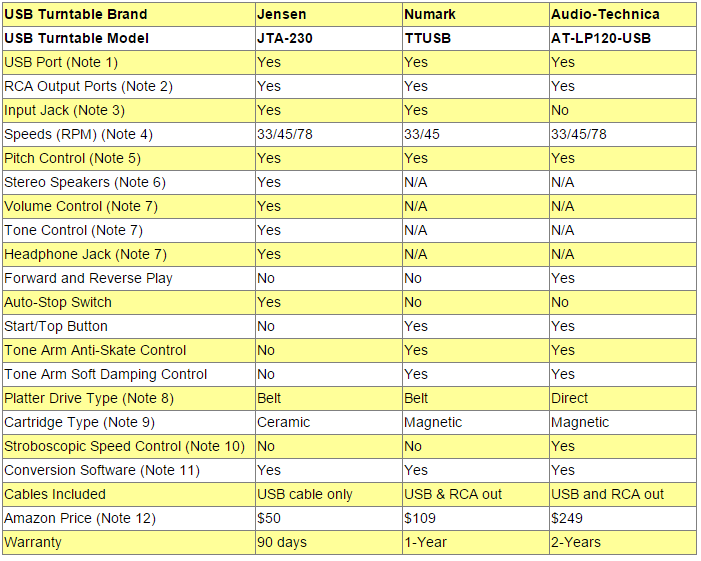 Compare USB Turntables: Jensen, Numark or Audio-Technica? You may have accumulated over the years a large number of vinyl records that are getting old, but that represent a wealth of music that you love and you want to preserve. You might also want to be able to listen to all that great music buried in vinyl when you are away from home using your smartphone, tablet or iPod. All this can be achieved using a USB turntable. USB turntables not only play records, but they can also connect to your computer's USB port to transfer the vinyl recordings to the hard-drive of your PC or Mac. Indeed, the USB turntables that will be compared here make digitizing your vinyl record collection to your computer a snap. Once transferred to your computer, you could put them on CDs or add them to online music libraries such as iTunes and access them via your smartphone, tablet or iPod. The three USB turntables that we will compare here are Jensen JTA-230, Numark TTUSB or Audio-Technica AT-LP120-USB which were the most popular in the USB turntable category at the time this article was written. Note that each had received an average rating of more than 4 stars (out of 5 stars) from Amazon reviewers who bought them. Note also that Jensen JTA-230 is really a standalone stereo system with speakers, while the Numark TTUSB and Audio-Technica AT-LP120-USB turntables were designed to be great turntables and not complete stereo systems. Selected USB Turntables on Amazon. All three turntables are USB equipped and allow the transfer of vinyl recordings to your computer. To do this you will need to install in your computer the software that comes with the turntable (Audacity software or other), connect the turntable to the computer using the provided USB cable, and follow the steps described in the instructions that come with the software. Note that once the recordings are digitized on your computer, you can transfer them to online music libraries such as iTunes and access them using your iPod, smartphone, etc. Jensen JTA-230 does not have a pre-amplifier built in; therefore the RCA out signal is too low and cannot be directly connected to external speakers. It needs to be connected to a receiver with a built-in amplifier. On the other hand, Numark and the Audi-Technica are equipped with pre-amplifiers. They each provide both a phono level non-amplified and a line level amplified output signal. The phono level output signal is there so that the the turntable can be connected to a receiver with phono input ports. The line level output signal can be directly connected to external speakers or to a receiver with line level RCA input ports. On the Jensen, the input jack can be used to connect external audio devices like MP3 players or CD players, so you can listen to your external source through the speakers of the Jensen system. On the Numark, the input jack can be used to transfer music to your computer from other line level sources such as cassette tapes, making this unit the ideal apparatus for filing older style recordings, regardless of their original formats. Numark TTUSB supports only 33 and 45 rpm speeds. To play 78 rpm vinyl records you would need to find some signal processing software that would convert 78 played back at a slower speed back to its proper speed. Pitch control allows you to fine tune the playing speed of the record once the correct speed (33/45/78 RPM) is chosen. You simply need to slide the pitch adjustment switch to slightly increase or decrease the speed of the turntable if necessary. All three turntables provide this feature, but Audio-Technica also provides stroboscopic speed control (see Note 10 below). Only the Jensen turntable has stereo speakers as it is really a basic stand alone stereo system with a USB port. The Numark and Audio-Technica were designed to be great turntables and not complete stereo systems. Therefore they do not have any built-in speakers. Because the Numark and the Audio-Technica turntables are not stand-alone stereo systems, they do not have any volume or tone control, or headphone jacks. These features are not applicable (N/A). From a sound quality perspective, there isn't a significant difference between the two drive types. Belt drives are known to isolate better vibrations and they cost less. Direct drives are preferred by professionals like DJs because of their high torque motors. Magnetic cartridges have an inherent loss of signal; therefore turntables with magnetic cartridges need a pre-amplifier for the line level signal to be adequately converted to computer files. Ceramic cartridges use a piezoelectric element to translate the movements of the needle to electric form resulting in output voltages that are higher than in magnetic cartridges, so no pre-amplifier is required. Audio-Technica is also equipped with stroboscopic platter speed indicator which allows accurate setting of the rotation speed of the platter so that the music is neither too slow nor too fast. The turntable actually will do this automatically, but the feature allows you to monitor the speed or change it if desired. The way this works is that there are little dots on the side of the platter. A light shines on them. If the dots don't appear to be moving, the turntable is rotating at the right speed. All three turntables provide on CD the conversion software required to transfer the vinyl recordings to your computer in digitized form. You simply have to follow the instructions. So which of the three USB turntables is best for you? 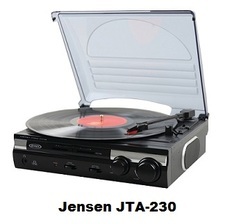 First note that Jensen JTA-230 is in a class by itself and quite different from the Numark and Audio-Technica turntables: it is a self contained basic stereo system with speakers, while the Numark and Audia-technica are just turntables that need to be connected to audio systems. But we underline here the word basic. Given the low price and all the features the Jensen comes with, there is plenty of value here for your money, but you will not be getting a stereo system that can be played in large rooms for large parties. Indeed, the speakers are adequate for personal listening, but not powerful enough for large spaces. In addition, the RCA line-out is not powerful enough to be connected to external speakers directly and will first need to be connected to an amplifier or another stereo system. Finally, the tone arm is quite basic and does not come with more sophisticated features such as skate and damping control. But if your are not too fussy and looking for a small self contained stereo system that will also allow you to convert your old vinyls into digitized music that you can burn onto CDs or transfer to online libraries such as iTunes, you will find this unit quite acceptable. It is much heavier than the Numark TTUSB (23.5 lbs vs 7.7 lbs). The weight of a turntable can determine how well vibrations are isolated from the needle. A lighter turntable would have poorer isolation and may skip when there are too many interfering vibrations such as heavy footsteps or shutting doors around the player. Therefore, the Audi-Technica would be much less prone to skipping if there is lots of noise and vibrations in the room. 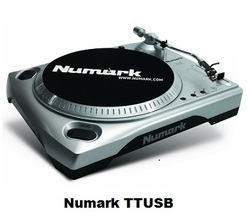 It supports all three vinyl speeds (33,45 and 78 rpm), while Numark TTUSB supports only 33 and 45 rpm. It is equipped with stroboscopic platter speed indicator which allows accurate setting of the rotation speed of the platter, so the music is neither too slow nor too fast. Regarding platter rotation speed the Audi-Technica turntable is extremely accurate. It supports forward and reverse play. It uses direct drive technology which is more expensive to implement than belt drive technology used by Numark TTUSB. Finally, it comes with a 2-year warranty while the warranty on the Numark TTUSB is 1 year. On the other hand Numark TTUSB has a neat feature not found on the Audio-Technica: it has an input jack that can be used to transfer music to your computer from sources other than vinyl records (such as cassette tapes), making this unit the ideal apparatus for filing older style recordings, regardless of their original formats. You will find below all the USB turntables compared above. Please click the turntable of your choice below for price information or to purchase. Note that Audi-Technica also makes a more sophisticated USB turntable suited for professionals such as DJ's. 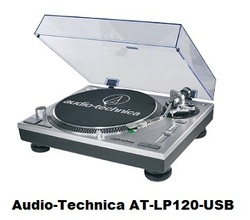 Audio-Technica AT-LP1240-USB is an advanced featured USB turntable quite a bit more expensive than the turntables compared above. It is provided below in case you might be interested. Please click the image for exact price and detailed product information.